One Potato, Two Potato | Jake & Sam -- Let's Cook! These are my two favorite potato salad recipes – not your usual American potato salad with loads of mayo and maybe sour cream and hard-boiled eggs and celery and whatever. Except for the potatoes, these two couldn’t be more different. 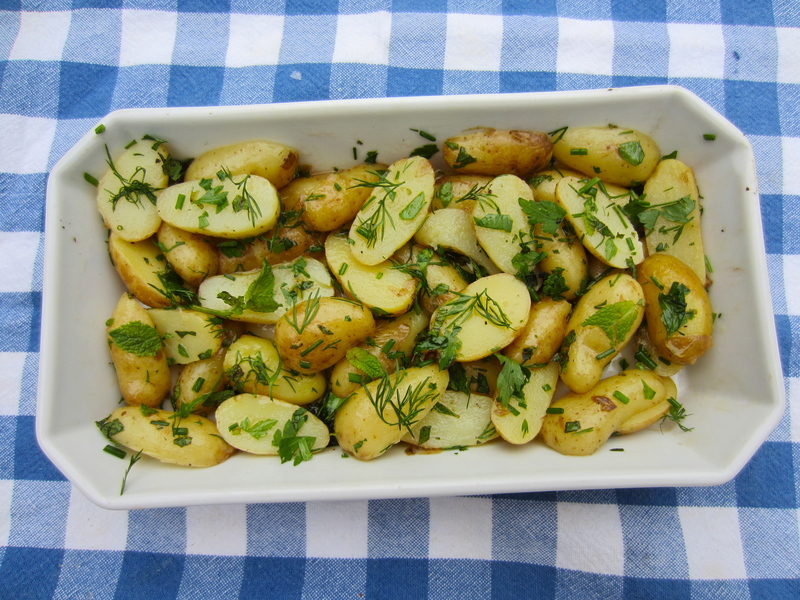 The first is herbed potato salad. When I co-owned Fête Accomplie, a catering business and gourmet carry out in Washington D.C. in the 80’s, it was one of our most popular dishes. I think people liked the fact that it’s healthier than most potato salads, goes with just about everything, keeps for days, and – need I say – is also quite delicious. Boil the potatoes in salted water until just cooked. Drain well. When cool enough to handle, cut them in half and put them in a bowl along with the chopped herbs. Make the dressing: Mix all the ingredients together in a pestle and mortar or bowl. Add to the potatoes and herbs. Toss well. It can be served at once but keeps for several days in the refrigerator. Note: I have found that it tastes quite differently if dressed when the potatoes are warm and absorb the dressing well. If you dress them when they get cold, the dressing mostly simply coats the potatoes. I’m not sure which I prefer. You’ll have to try it both ways and decide for yourself. Note from Brad: If you happen to have any cooked mussels on hand (here in France we often do), shell them and mix them into this potato salad, leaving out the mint and dill. It’s a poor man’s Salade Francillon (minus the black truffles), a recipe created by Alexander Dumas. It’s a real treat. The second is my version of Ensalada Rusa, which, surprise, surprise, originated in Russia, but has for many years been found on the counters of tapas bars in Spain. It is also wildly popular in Latin America and elsewhere. The original Russian version called Salade Olivier contained such exotic ingredients as grouse and crayfish, but it has moved a long way since then. It is still quite exotic with, beside the potatoes, additions such as peas, carrots, green beans, roasted red peppers, olives, tuna and hard-boiled eggs. I usually make it for festive occasions like the Fourth of July or Bastille Day. I like to mound it up on a platter like a cake so that it can be cut into wedges. As you can see from the picture, I sometimes get a little carried away with the decoration. If I’m going to serve it on its own as a tapa or separate course, I usually add the tuna and hard-boiled eggs. But I leave them out if it’s accompanying a barbeque or other main course dishes. It’s very rich and goes a long way but is still worth making in fairly large quantity, as it’ll keep in the refrigerator for a few days and is certainly worth a second visit. Boil the potatoes until cooked but still firm. Drain them, and when they’re cool, cut them into about 1/2″ dice. Cook the carrots, adding the peas to the water for the last few minutes (or cook frozen peas and carrots according to the package directlons.) Drain well. Cut half the pepper strips into small dice, saving the rest for decoration. Slice the green olives into 4 or 5, saving half for decoration. 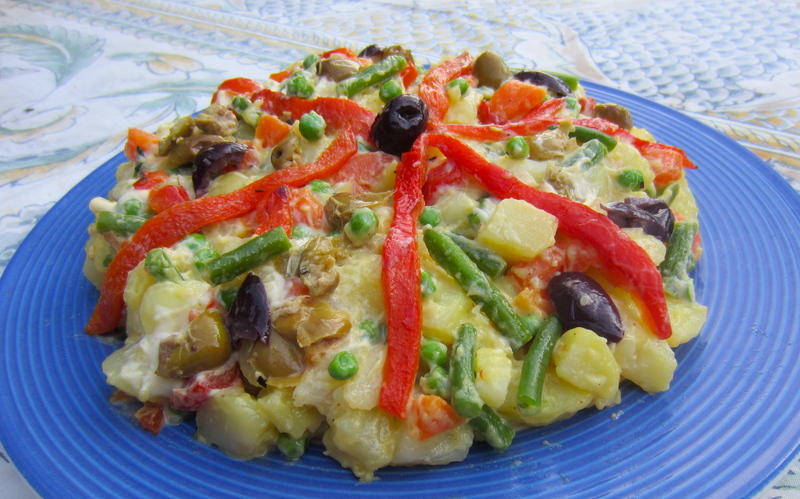 Put the potatoes, carrots, peas, chopped peppers and olives into a mixing bowl, along with the optional green beans. If you’re planning on using tuna and/or eggs, add them as well, saving some of the chopped egg for decoration. Now comes the fun part: Mound the salad on a platter, shaping it like a cake. Decorate with the sliced peppers, olives, and chopped egg if you’re using it. I add a few black olives for color if I have them on hand. The flavor will improve if you let it sit for an hour or two. Be prepared for lots of “ooh’s” and “aah’s” when you serve it.